Andiamo is celebrating Labor Day with a Buy One Get One FREE offer this Sunday. September 3, 2017 - where you can buy one entree, and get one FREE up to $25 value. 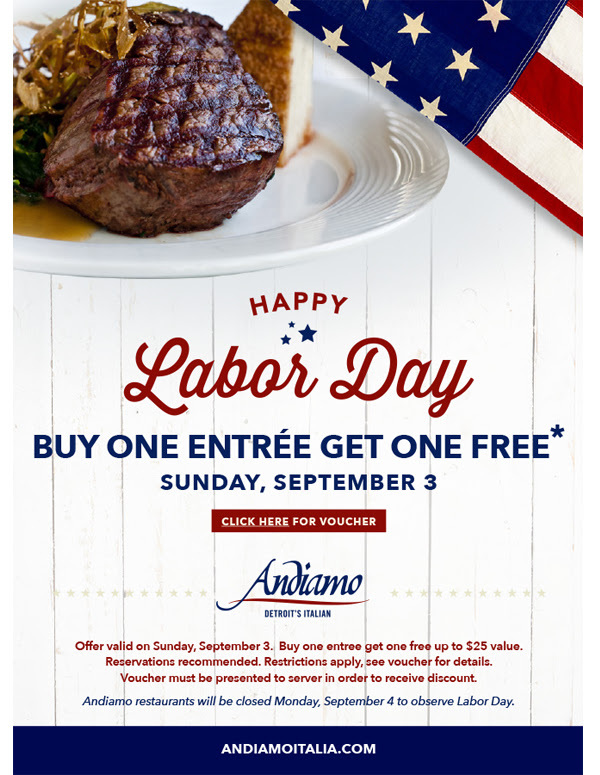 Andiamo locations will be closed on Monday, September 4th to observe Labor Day. Reservations are recommended. Restrictions apply, see voucher for details. Voucher must be presented to server in order to receive discount. Offer may not be combined with any other offer or discount. Please present voucher at time of order. Mille Grazie Dollars and Costco Gift Cards may not be redeemed in conjunction with this offer. Void where prohibited by law. Not available for tickets, food, or beverage at the Andiamo Celebrity Showroom, Joe Vicari’s Andiamo Italian Steakhouse in Las Vegas, Andiamo Metro Airport or the Andiamo Food Truck. Dine in only, not valid for Brunch or tables of 10 or more. other restrictions may apply. Tax and gratuity excluded. No cash value.